Lake Taupo is a lake in the North Island of New Zealand. It is in the caldera of the Taupo Volcano. 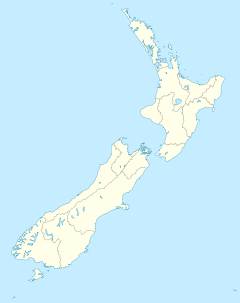 With a surface area of 616 square kilometres (238 sq mi), it is the largest lake by surface area in New Zealand, and the second largest freshwater lake by surface area in geopolitical Oceania after Lake Murray (Papua New Guinea). Motutaiko Island lies in the south east area of the lake. Lake Taupo is in the Waikato Region of the North Island. Lake Taupo has a perimeter of approximately 193 kilometres and a deepest point of 186 metres. It is drained by the Waikato River (New Zealand's longest river), and its main tributaries are the Waitahanui River, the Tongariro River, and the Tauranga Taupo River. It is a noted trout fishery with stocks of introduced brown and rainbow trout. Lake Taupo is in a caldera created by a supervolcanic eruption which occurred approximately 26,500 years ago. According to geological records, the volcano has erupted 28 times in the last 27,000 years. It has ejected mostly rhyolitic lava, although Mount Tauhara formed from dacitic lava. The initial event 26,500 years ago is known as the Oruanui eruption. It was the world's largest known eruption over the past 70,000 years, ejecting 1170 cubic kilometres of material and causing several hundred square kilometres of surrounding land to collapse and form the caldera. The caldera later filled with water, eventually overflowing to cause a huge outwash flood. It is possible that the Lake Taupo event contributed to starting the Last Glacial Maximum. Several later eruptions occurred over the millennia before the most recent major eruption, which is traditionally dated as about 180 CE from Greenland ice-core records. Tree ring data from two studies suggests a later date of 232 CE ± 5. Known as the Hatepe eruption, it is believed to have ejected 100 cubic kilometres of material, of which 30 cubic kilometres was ejected in a few minutes. This was one of the most violent eruptions in the last 5000 years (alongside the Minoan eruption in the 2nd millennium BCE, the Tianchi eruption of Baekdu around 1000 CE and the 1815 eruption of Tambora), with a Volcanic Explosivity Index rating of 7; and there appears to be a correlation, to within a few years, of a year in which the sky was red over Rome and China. The eruption devastated much of the North Island and further expanded the lake. The area was uninhabited by humans at the time of the eruption, since New Zealand was not settled by the Māori until about 1280. Possible climatic effects of the eruption would have been concentrated on the southern hemisphere due to the southerly position of Lake Taupo. Taupo's last known eruption occurred around 30 years later, with lava dome extrusion forming the Horomatangi Reefs, but that eruption was much smaller than the 180 CE eruption. Underwater hydrothermal activity continues near the Horomatangi vent, and nearby geothermal fields with associated hot springs are found north and south of the lake, for example at Rotokawa and Turangi. These springs are the site of occurrence of certain extremophile micro-organisms, that are capable of surviving in extremely hot environments. The volcano is currently considered to be dormant rather than extinct because of moderate fumarole activity and hot springs along the shores of the lake. Much of the watershed of Lake Taupo is a beech and podocarp forest with associate understory ferns being Blechnum filiforme, Asplenium flaccidum, Doodia media, Hymenophyllum demissum, Microsorum pustulatum and Microsorum scandens, and some prominent associate shrubs being Olearia ranii and Alseuosmia quercifolia. Native faunal species in the lake include northern koura or crayfish (Paranephrops planifrons) and kokopu or whitebait (Galaxias species). The lake is noted for stocks of brown trout (Salmo trutta) and rainbow trout (Oncorhynchus mykiss), introduced from Europe and California respectively in the late nineteenth century. There has also been a subsequent introduction of smelt (Retropinnidae species) as a food for the trout. A community of sponges and associated invertebrates live around the underwater geothermal vents. Tourism is a major component of Taupo's commercial sector, and the city attracts over 2 million visitors per year. The busiest time for the industry is the high summer season around Christmas and New Year. The lake area has a temperate climate. Daily maximum temperatures recorded for Taupo range from an average of 23.3 °C in January and February to 11.2 °C in July, while the nighttime minimum temperatures range from 11.6 °C in February down to 2.2 °C in July. Rain falls in all seasons but is greatest in winter and spring, from June to December. Taupo hosts the Lake Taupo Cycle Challenge, a cycling tour around the lake which can take anywhere between four and ten hours. Hundreds of volunteers from the Taupo township are involved in the event. Skydiving is a popular local sport and tourist attraction. Taupo also hosts the Kellogg's Ironman event. Māori rock carvings at Mine Bay on Lake Taupo are over 10 metres high and accessible only by boat or kayak. On the north west side of Lake Taupo on the cliffs of Mine Bay, there are Māori rock carvings created in the late 1970s by Matahi Whakataka-Brightwell and John Randall. Carved in likeness of Ngatoroirangi, a navigator who guided the Tuwharetoa and Te Arawa tribes to the Taupo area over a thousand years ago according to Māori legend. The 10-metre-high carving is intended to protect Lake Taupo from volcanic activities underneath. The cliff has become a popular tourist destination with hundreds of boats and yachts visiting the spot yearly. Lake Taupo is a taonga (treasure or something special to the person) of Ngati Tuwharetoa from the Te Arawa waka. Ngati Tuwharetoa still own the bed of the lake and its tributaries. They grant the public free access for recreational use. ^ "Motutaiko Island: Current Nga Whenua Rahui and Matauranga Kura Taiao projects". Department of Conservation. Archived from the original on 4 March 2014. ^ Hogg A, Lowe DJ, Palmer J, Boswijk G, Ramsey CB (2011). "Revised calendar date for the Taupo eruption derived by 14C wiggle-matching using a New Zealand kauri 14C calibration data set". The Holocene. doi:10.1177/0959683611425551. ^ "Mean Daily Maximum Temperatures". NIWA. Archived from the original on 19 January 2012. Retrieved 1 September 2011. ^ "Mean Daily Minimum Temperatures". NIWA. Archived from the original on 19 January 2012. Retrieved 1 September 2011. ^ "Mean Monthly Rainfall". NIWA. Archived from the original on 19 January 2012. Retrieved 1 September 2011. 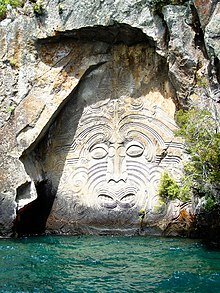 ^ "Maori Rock Carvings Lake Taupo". Retrieved 8 November 2011. ^ "New deed of settlement for Lake Taupo" (Press release). Ben G. Mason; David M. Pyle; Clive Oppenheimer (2004). "The size and frequency of the largest explosive eruptions on Earth". Bulletin of Volcanology. 66 (8): 735–748. Bibcode:2004BVol...66..735M. doi:10.1007/s00445-004-0355-9. "Taupo". Global Volcanism Program. Smithsonian Institution. Retrieved 2009-01-01. Wikimedia Commons has media related to Lake Taupo.